First Single-Platform Femtosecond Laser Now Commercially Available in European Union. iPharro�s Media Seeker Core Platform provides control over growing volumes of digital content. 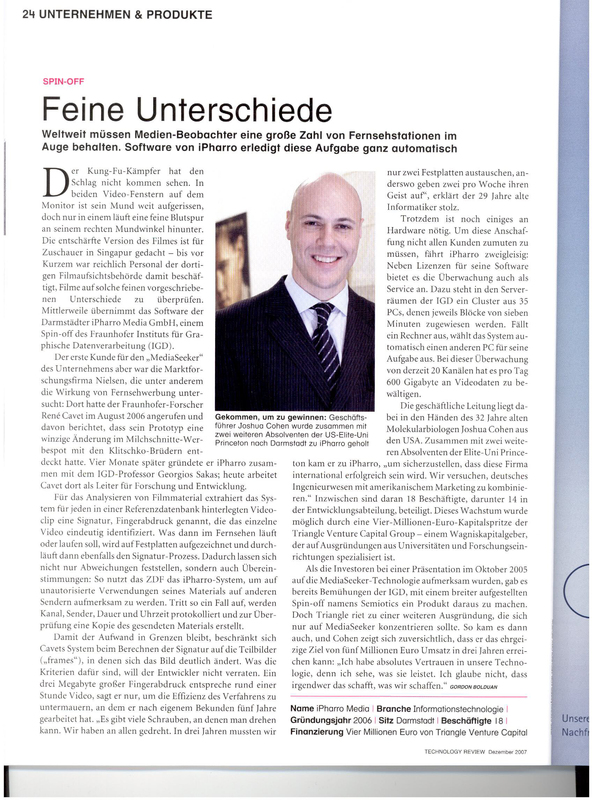 An interview between Joshua Cohen, CEO of iPharro Media GmbH and TV Technology. Munich-based TakWak GmbH, a spin-off from the leading fixed-mobile convergence provider fg microtec, receives �2.5 million from Triangle and ERP Startfonds to start operations and develop its unique, ruggedized outdoor device. The new company operates under the name Attensity Group and unites three software companies to form the world’s leading unstructured text business analytics vendor. Bausch & Lomb’s refractive eye surgery business has merged with Triangle’s 20/10 Perfect Vision AG. He who does not seek stays stupid! Web 3.0 technologies make efficient knowledge management possible. Companies have a treasure trove of customer intelligence. Now they also have the tools to make sense of it. European Space Agency (ESA) spin-off iOpener receives �4.1 million to start up operations. iOpener has developed a technology to map real-world competitions such as Formula 1 to an artificial world, allowing gamers to participate in the race virtually and in real time! Fraunhofer spin-off iPharro Media GmbH (formerly Semiotix) receives �4 million to start up operations. iPharro, a spin-off from the Fraunhofer Institute for Computer Graphics (IGD) located in Darmstadt, Germany, has developed software to identify videos much faster than in real time. German laser start-up Klastech receives �2.1 million in a Series A funding round. Klastech Karpushko Laser Technology GmbH (Dortmund) started operating in 2006 based on the results of the work of Prof. Fedor Karpushko, a leading scientist with more than 30 years of international experience in photonic research. St. Leon-Rot, Germany - August 18, 2006 ?fg microtec, the reference provider of leading-edge mobile VoIP applications such as push-to-talk and video sharing is taking the next steps to enhance its global presence. German research spin-off X-aitment receives �3 million to start up its operation. X-aitment, a spin-off from the German Research Center of Artificial Intelligence (DFKI) develops software systems to automate repetitive and highly time consuming tasks in the development of computer games. 20/10 Perfect Vision, the laser eye specialist for non-invasive laser vision correction and therapeutic eye operations, closed a EUR4.1 million round to finance the market roll-out of its FEMTEC?laser workstation. fg microtec, a manufacturer of embedded software for managing communication flow in mobile phones, closed a EUR 2.3 million Series B round to finance further growth in the Asian market. Each spring we conduct a rigorously unscientific survey ?picking the brains of gurus and geeks to cull truly innovative companies from a frothy sea of poseurs. Today�s esprit decool flows from San Diego to Beijing, encompassing touch recognition, noninvasive biopsies, and - at last! - self-heating coffee. And this year there�s a bonus: You get to choose the next Google. Great demand for FEMTEC laser eye technology on European and Asian markets ?Triangle portfolio company accelerates growth. Laser eye specialist 20/10 Perfect Vision from Heidelberg, Germany, will receive another �3 million from its current investors in order to meet demand for the new femtosecond (FEMTEC) laser technology in Europe and Asia. Imagine in the year 2006 during the Soccer World Cup you ask your internet search engine "Who has played the most games for the German national team?" Today your Google would give you 186.000 hits. Tomorrow, with SmartWeb the answer would be: "Lothar Matth�us with 150". 20/10 PERFECT VISION Optische Ger�te GmbH announced today that it has received the CE mark for its new FEMTEC?laser. The FEMTEC is a revolutionary femtosecond laser for creating the corneal flap in patients undergoing LASIK surgery. The FEMTEC laser features a patented curved patient interface and is fully automated. 2004 ?20/10 PERFECT VISION Optische Ger�te GmbH announced today that it has received 510(k) clearance from the U.S. Food and Drug Administration (FDA) to market its new FEMTEC?Laser Microkeratome. The FEMTEC device is a revolutionary femtosecond laser system for use in the creation of a corneal flap in patients undergoing LASIK surgery or other treatment requiring initial lamellar resection of the cornea. At this year's contest within the framework of the 24th Innovation Prize of German Business, two companies, namely the 20/10 Perfect Vision Optische Ger�te GmbH (Optical Systems Ltd.) and the IPCentury AG, two portfolio companies of the Triangle Venture Capital Group were among the best five in the finals. Triangle Venture Capital Group has taken another important step on the way to a successful exit through the sale of the WaveScan-business unit of 20/10 PERFECT VISION. The buyer is the global leader in LASIK devices, VISX, Inc., of Santa Clara, CA. fg microtec the inventor of the Predictive Flow Control (PFCTM) technology for boosting the performance of WAP based services such as MMS and IM announced today that it has entered in to a commercial and development partnership with Comneon, the software branch and 100% subsidiary of Infineon Technologies. fg�s fmM1251 optimisation suite will provide customers of Comneon�s APOXITM development environment, shorter response times, higher throughput and reduced power consumption for WAP based applications such as MMS. Close behind the recently concluded growth financing of IPCentury AG, Triangle Venture Capital Group has again proved the success of its investment strategy with the conclusion of follow-on financing at Attensity Corp., Salt Lake City, UT. Triangle Venture Capital Group has successfully pursued its strategy of early-phase investment in select high-tech companies by concluding, as planned, a round of growth financing for its portfolio company IPCentury AG.